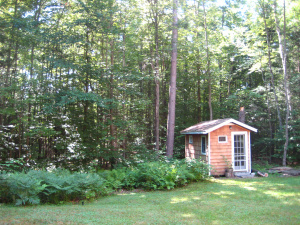 My friend, poet Liz Ahl, has been posting a series of blogs about writers and their spaces. Finding a room of one’s own (or a cabin, a loft, or a tiny corner of the world) can’t be a necessity for a writer–more often writers have to adapt and learn to write on airplanes and in dentist’s waiting rooms and at playgrounds–but having a dedicated writing space sure helps. And often those writing spaces are just as artful and carefully thought-out and downright magical as a good poem or short story can be. I really had no concept of having a writing space until I went with a group of friends to visit Ted Kooser at his farm in Garland. Ted had two writing spaces–a winter space that was in a loft by his kitchen, accessible by a ladder he’d built himself, and a summer space that was an old chicken coop he’d refashioned into a study, full of books and files of all his correspondence, which I itched to get a peek at. I already had been swept away by the stark simplicity of Ted’s poetry–having him share the space where he created those poems was even a greater gift. To see a writer’s space is to better understand where the writing comes from and what goes into it beyond the simple careful and artful presentation of words on the page. The home for the writer is also the home for the book. So today I give a link to this wonderful site for writers’ houses. They run the gamut, from Thoreau’s tiny cabin to Edith Wharton’s huge mansion to Maurice Sendak’s Brooklyn apartment–enough to inspire us all. Thanks for the shout-out! 🙂 And for reminding me about Ted’s great place….